In a medium pot whisk together flour, cocoa powder, espresso and 1/2&1/2. Cook over medium heat, whisking constantly until thickens about 5 minutes. Remove from heat and place in a small bowl, cover with plastic wrap placing wrap on surface. Let stand 30 minutes or until cool. 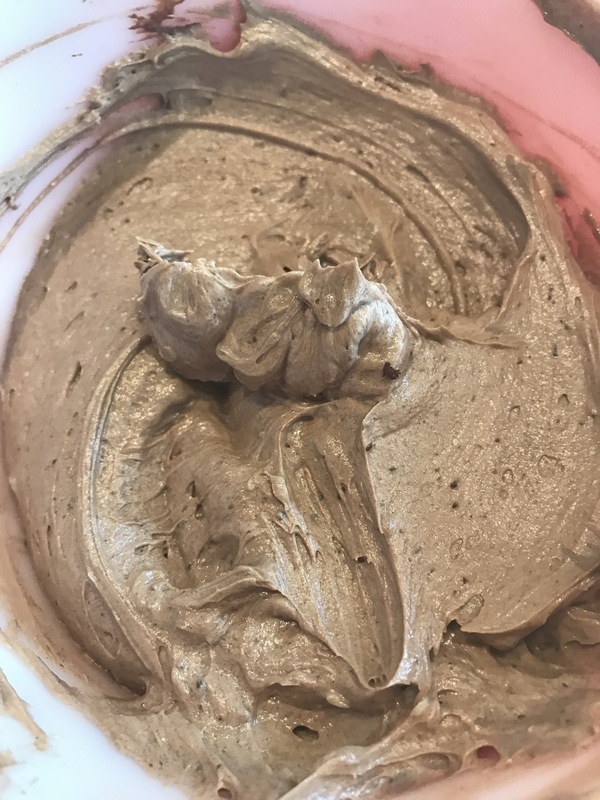 In bowl of mixer cream together butter and powdered sugar, add cooled mocha mixture 1 Tbsp at a time, beating until combined after each addition. Add vanilla and beat until whipped cream consistency. So, today is the last day of #Choctoberfest. Hopefully you were able to find a few new chocolately recipes. My last post for choctoberfest is what I am calling my Grand Finale. I made this triple Chocolate Mousse Cake for my son’s 19th Birthday and it has been killing me keeping it from you all!! LOL Trust me when i say this looks harder than it is the only baking involved is the brownie bottom, but you do need to extend your 9 inch springform pan a couple of inches to hold all the chocolatey goodness, so start by lining the bottom of your springform pan with parchment paper. 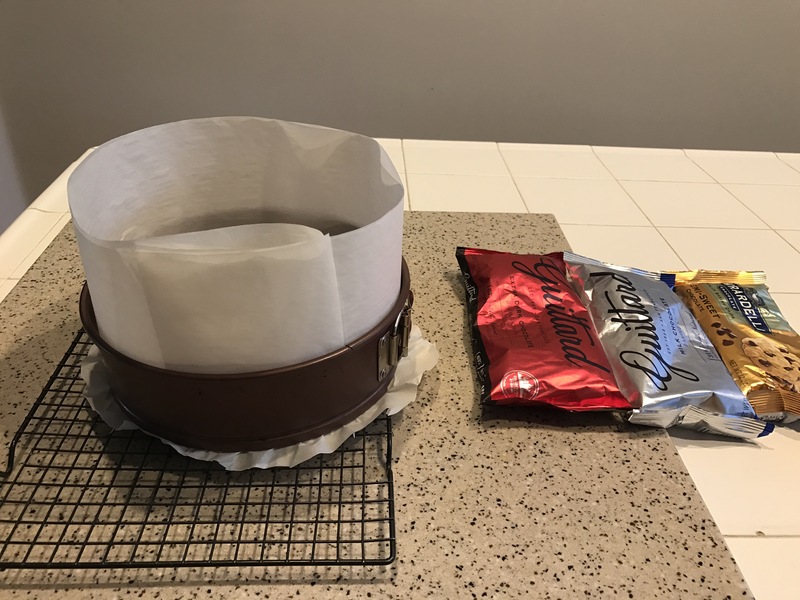 After you have lined the bottom build a ring out of parchment that is at least 2 inches taller than the top of your pan. Now you are ready to begin…..
follow the directions on your box of brownies and then carefully pour into your already prepared pan and bake according to the 9×9 times to follow. Remove from oven and let cool completely. Once cooled you can remove onto the next layer. Combine chocolate and 3/4 cup heavy cream in a microwave safe bowl. Microwave in 30 second increments stirring every 30 seconds until the chocolate is melted and smooth, let cool to room temperature. While you wait for your chocolate to cool. Mix the gelatin and water together and set aside to let the gelatin absorb. When your chocolate is cool microwave the gelatin bowl for 15 seconds, pour melted gelatin and chocolate together. Whip the remaining 1 cup heavy cream to stiff peaks. Carefully fold chocolate into whip cream just until incorporated. Spread your first layer on top of your cooled brownie and set in fridge for 25 minutes to firm up. 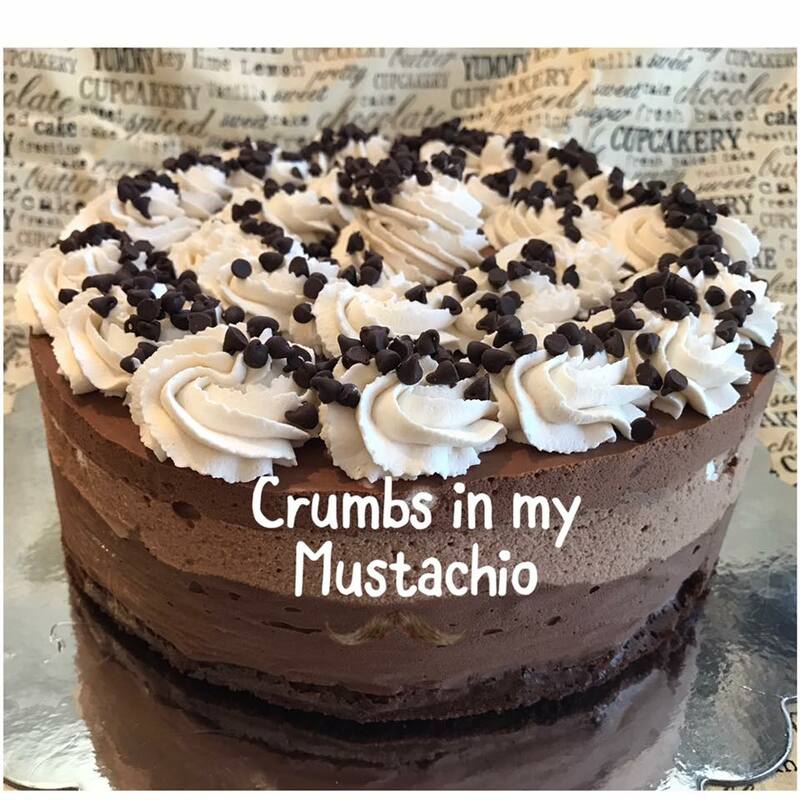 After 25 minutes….. Continue on the same way you made the Dark chocolate mousse layer except using the milk chocolate chips and set back in fridge for another 25 minutes. Once your milk chocolate layer has firmed up (25 minutes) make the semisweet layer and place on top of the milk chocolate layer. Let firm in fridge overnight. Remove from spring form pan place on a cake board and top with whipping cream and mini chocolate chips!! ENJOY!! Day 10 of #Choctoberfest!! First I need to start with I received free product from Imperial Sugar in exchange for a post all the opinions are my own. 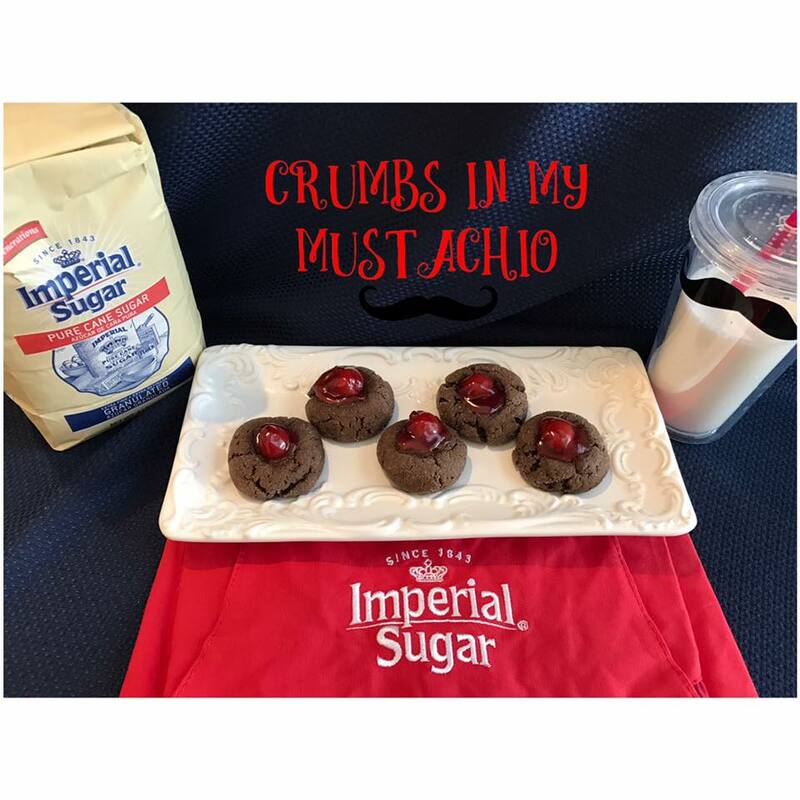 What better way to use Imperial Sugar then making a Chocolate sugar cookie, but plain chocolate sugar cookies were well just a little to plain so I had to add some cherries to push this one over the top. These little gems will be the center pieces of my Christmas Cookie platters this year. Don’t the look like Roudolph noses??? Yes, I know Christmas is still I few days away but I like to plan ahead. Pour yourself an Ice Cold Glass of Milk and let’s get started. Preheat oven to 375 degrees and line three baking sheets with parchment paper, set aside. Mix flour, baking soda and salt in a small bowl, set aside. Microwave chocolate and butter in a large microwave safe bowl for 2 minutes. Stir until chocolate is completely melted. Add cream cheese and continue to stir until cream cheese is completely melted. Stir in 1 cup sugar, egg, and vanilla. Add flour mixture and mix well. Place Dough in fridge for about 20 minutes. Roll dough into one inch balls and then roll into a bowl filled with your remaining 1/4 cup of Imperial Sugar and place on already prepared baking sheet. Press your thumb into center of each cookie. In a small bowl mix cherry pie filling with almond extract. Into the center of each cookie fill indentation with one cherry. In slow cooker add butter and chicken breasts at the bottom. 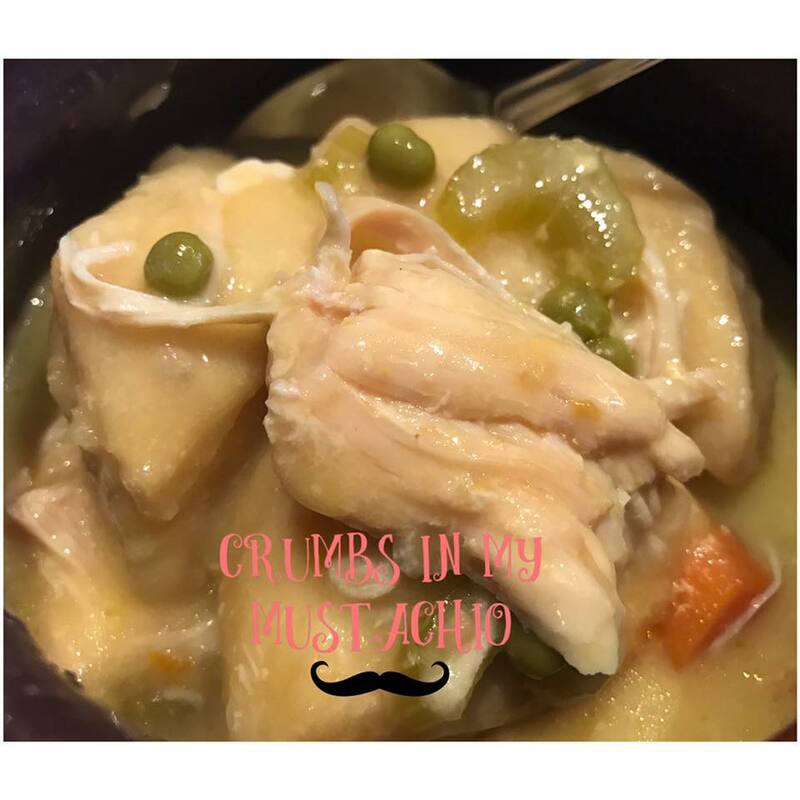 Spoon cream of chicken soup over chicken breasts. Pour in can of chicken broth. Place carrots and celery on top. Cook on high 6 hours. Carefully shred chicken and then add can of peas. Place quartered biscuits on top and continue to cook on high for 1 more hour. Day 8 of #Choctoberfest and I have Breakfast ready for you! First, I need to start by saying I received free product from Caveman Coffee in exchange for a post. All the opinions are my own!! A while back I had bought a couple mini donut pans and had forgot that I had them, so when I was digging through my cupboard the other day I was so glad they fell out. I had been wanting to make donuts and could not wait to try Caveman Coffee Cocoa Butter. When I unsealed the bag of cocoa butter the smell was out of this world I just knew that I had to use it to make some Chocolate Donut Bites. Don’t worry if you don’t have a donut pan no need to run out and by one you can has make them in a mini muffin tin. 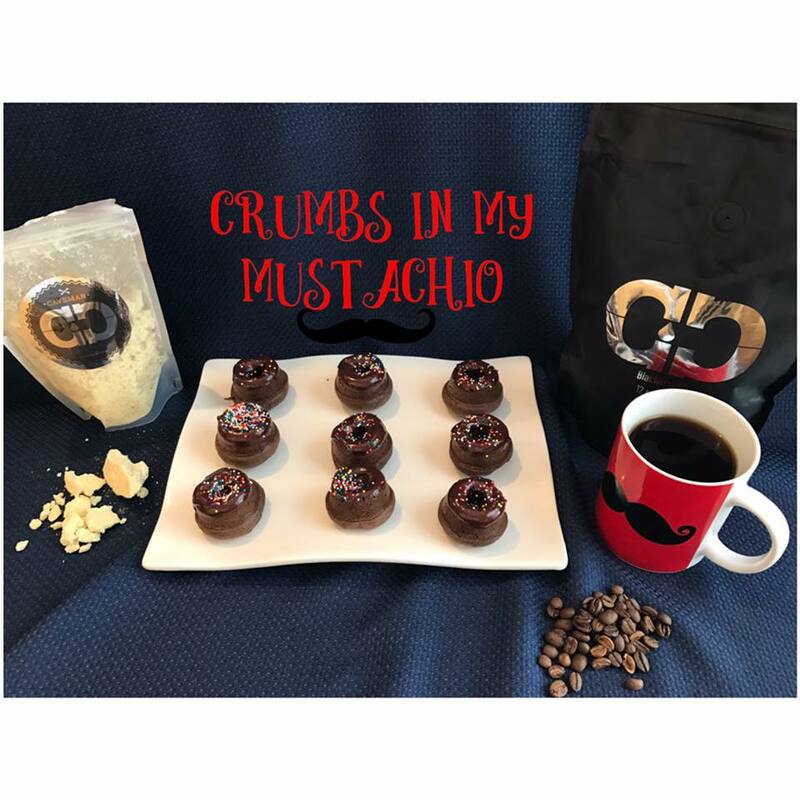 Now get your coffee pot ready also because you are going to want to make yourself a delicious cup of Caveman Coffee to sip on why you enjoy your donuts! Preheat oven to 350 degrees and lightly spray your mini donut pans with nonstick spray, set aside. Bake at 350 degrees for 8-10 minutes. Remove from oven and let cool in pan while you make the chocolate glaze. In a microwave safe bowl place chocolate chips, cocoa butter and corn syrup, microwave until melted and stir till smooth, add 1 tsp hot water and stir till combined. Remove donuts from pan and dip in chocolate glaze. Sprinkle with your favorite sprinkles and ENJOY!! Brew a pot of Caveman Coffee and add just a little bit of the Caveman Cocoa Butter to your mug, pour coffee on top stir until melted and enjoy the BEST CUP of COFFEE!! First let me get all the important stuff out of the way… I received free products in exchange for my post but all the opinions of the product our my own. Now, with that out of the way… Day 4 of #Choctoberfest and I have something for you that is not only YUMMY but also healthy. Many of you know that I have been on a green smoothie kick, and I think this just might be my favorite one. I always start with plain old water and some sort of green such as spinach, spring mix or kale and then add some fresh and some frozen fruit hence why I call them green smoothies even if they always don’t look green. LOL! 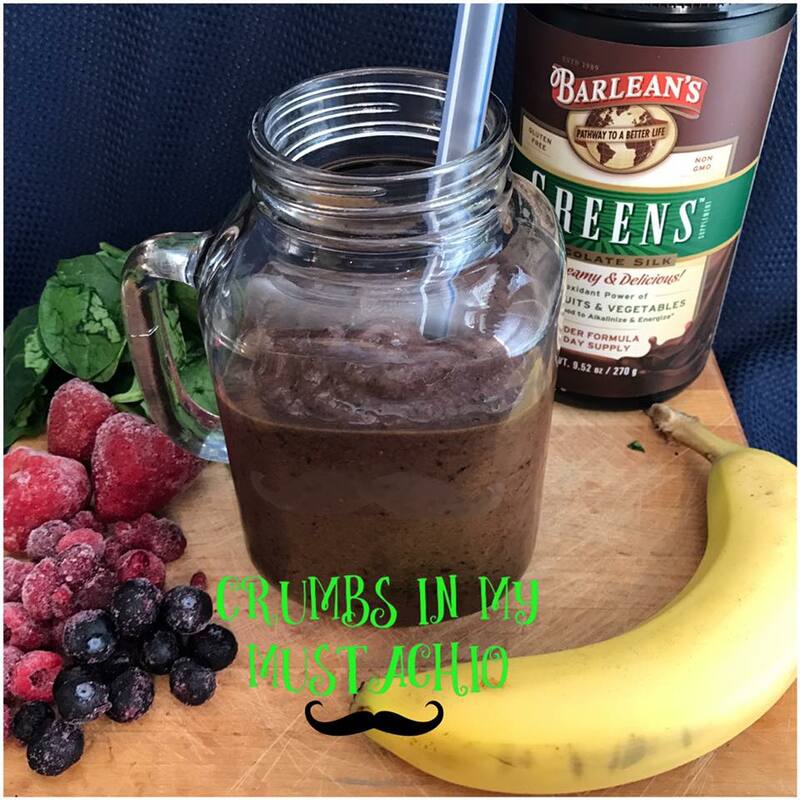 I was so excited to receive the Barleans Chocolate Greens Powder once again this year and let me tell you it added a little extra to my smoothie that I might be willing to push aside my scoop of ice cream in the evening and opt for this Chocolate Banana Berry Smoothie. Give it a try……. Preheat oven to 350 degrees. Line with parchment paper one 9×13 baking pan and then spray lightly with nonstick spray and set aside. Melt butter and then stir sugar into melted butter. In a medium bowl add eggs. Add a little bit of your butter sugar mixture to eggs and beat with a wooden spoon so not to temper your eggs. Add the rest of your butter sugar mixture to egg bowl and stir till combined. Pour in vanilla, then cocoa, flour, salt and baking powder. Stir until combined well and then pour into your already prepared 9×13 baking dish. Now you are ready to make your Monster cookie layer….. In bowl of mixer add butter and Imperial Sugar, Cream together the butter and the sugar. Add vanilla and egg, cream again until smooth. Add flour, baking soda and salt, stir until combined. Add M&M’s chocolate and peanut butter chips and coconut and stir until combined. 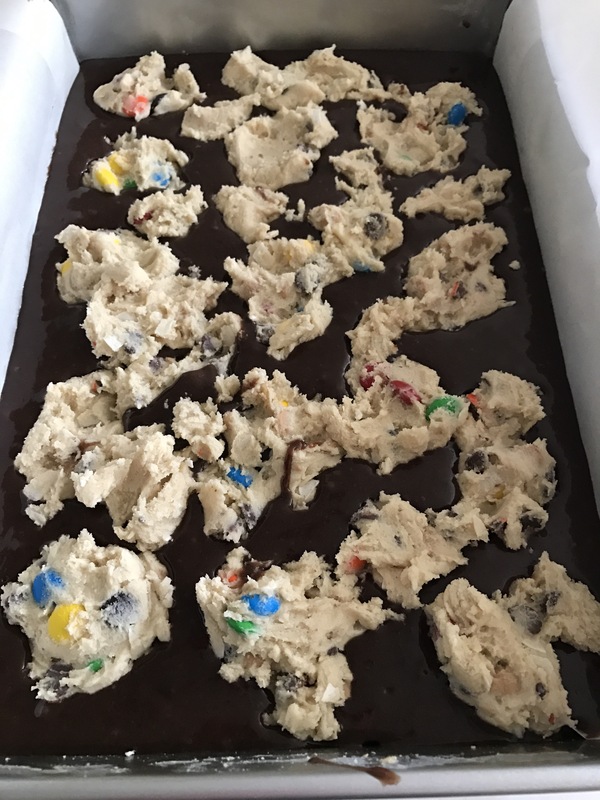 With a 1 Tbsp cookie scoop drop “scoops” of your monster cookie dough on top of your already prepared brownie mix. Gently push your cookie into your brownie. Bake at 350 degrees for 40 minutes or until a toothpick inserted in the center removes clean. Let cool on wire rack 15-20 minutes , remove from pan and continue cool. ENJOY!